Essays by Lynne Cooke, Michael Govan, Getrud Sandqvist, Susan Stewart. 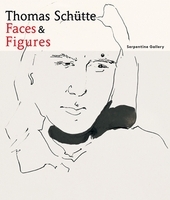 Fundamentally, my works are almost always in the nature of a proposal, Thomas Schütte contends, while conceding that "nonetheless, mostly they exist in the form of models." Schütte's notion of models is, consequently, encompassing and complex: at its core lies hypothesis and speculation. This new monograph explores in detail the vast scope of work by this renowned mid-career German artist by documenting a tripartite, eighteen-month exhibition at the Dia Center for the Arts which in effect constitutes a retrospective overview of the artist's oeuvre. Devised in three segments with distinct points of reference, this unusually extended presentation revealed the extraordinary inventiveness and diversity of Schütte's production. Scenewright, the first installment, from September 1998 through January 1999, focuses on issues relating to scenography and theater. Gloria in Memoria, from February through June 1999, explores memorials, monuments and antiheroes, and includes works ranging from installations and sculpture to drawing. The third and final phase, In Medias Res, from September 1999 through June 2000, concentrated on recent ceramics, shown together with a new series of related monumental steel sculptures. The accompanying catalogue follows the same format as the exhibition, with essays by Dia curator and renowned art scholar Lynne Cooke as well as acclaimed poet and critic Susan Stewart.